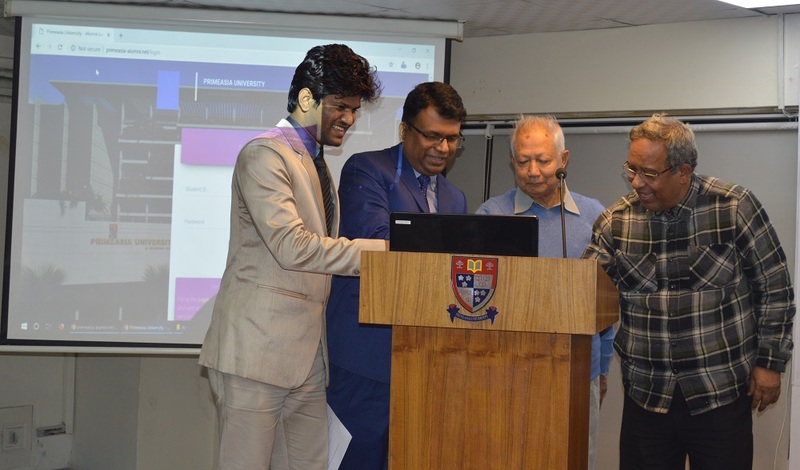 Primeasia University Alumni Web Directory launched on Thursday, January 24, 2019 at the IQAC Conference Center at its campus, Banani, Dhaka. Dr. Mohammad Kaykobad, Professor of Computer Science and Engineering (CSE) Department of Bangladesh University of Engineering and Technology (BUET) and, AKM Ashraful Haque, Vice Chancellor (Acting) and Treasurer of Primeasia University and Prof. Dr. Gias uddin Ahmad, Former Vice Chancellor of Primeasia University inaugurated the Alumni Web Directory of Primeasia University. This Alumni Web Directory will contain records who have graduated from this University. The web directory provides access to alumni student to login and update their data through online. The aim of the alumni community is to build a network for Primeasia University graduates. The Students of Primeasia University who have completed their Bachelor/Master degree during Fall 2003 to Fall 2017 are eligible to update data in the Alumni Web Directory. The Graduates who got admitted before Summer-2014 they need to send an Email to alumni@primeasia.edu.bd from their personal valid email address and attach their provisional or Main Certification scan copy. The University will send to the Alumni Web Directory User ID and Password through their email address.